Olivia has become very independent these days. Just last week, she started taking her own shower. She wet herself with the shower head, put soap on her body and rinsed it off. She refused to let me help do her back and would try the hardest to do it herself. In fact, she insisted on doing everything herself, from getting out of the bath to drying herself with the towel. In fact, I made the ‘mistake’ of drying her back and she threw a fit, crying and insisting I put water back on her back…..
After drying herself, she would put her pajamas on by herself. In the morning, she would dress herself with the outfit that I had laid out. Thank god she has YET to insist on choosing her own outfit. 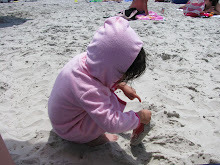 Most people would say this is good, right….Well, yes, it is great that she is so independent but that also means she is growing up….TOO FAST! She is my baby……she is only 3 but acting like 13! I wonder if this is a trait of a firstborn and an only child…..
One night, Olivia saw me cleaning the toilet bowl. She asked me “Cleaning the toilet?” I said “Yes, cos daddy made a mess”…..hehe. A while later, when she was going pee pee in the toilet, this was our exchanged. Olivia: Daddy made a mess? Me: Yes, men always make a mess. Olivia: And you clean it up? Me: No, ask the men to clean it up! Olivia: And the men say No. It does look like Olivia can read but she just has a good memory. She turned the page at the right moment and didn’t miss any word or sentence. I thought it was pretty amazing. How would you feel if you child told you ‘Nobody likes me’? I was having a conversation with Olivia about who are her friends in class and she said only C is her friend, followed by ‘nobody likes me’. When I heard that, I felt a stab in my heart. We have all gone through the period where we felt that we were the odd one out but who would want that to happen to their child/ren. In addition, Olivia is only 3, I felt the children are too young to be mean to one another. Go figure….I tell ya….we are screwed when she is older. I am a handicap when it comes to arts and crafts stuff or creative ideas. My left brain is absolutely more developed than my right brain. I have no interest in knitting or crocheting and was never able to create any crafts with my own ideas. Usually, during the holiday season and at the end of the ‘school year’ when Olivia move up to the next class, I would buy a little something for the teachers and assistants. It was fine when there are only 2-3 teachers but when there are 7 or 8, it could get quite expensive, especially in these economic times. So, I was forced to be crafty. 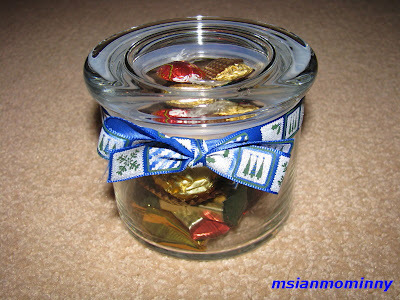 I decided that I would decorate glass jars with ribbons and put chocolate treats in them. I mean, who doesn’t like chocolates, right? 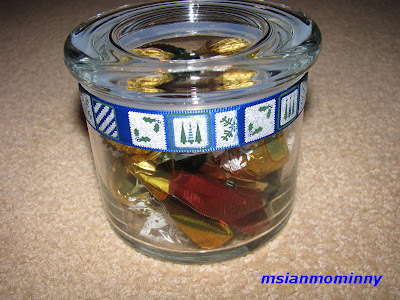 This way, Olivia can also take part in creating the gifts by filling the jars with chocolates. I came up with 2 versions – one with a bow and the other is just plain. What do you think? Olivia’s nursery class nominates a student each week as Student of the Week (SW). The SW helps the teacher distribute materials, lead the other kids down the hall etc. In the past few months, Olivia has occasionally came home with the teacher’s note saying she hit somebody, she drew on the table, she is not listening…..so I told hubby, at this rate, she will never be a Student of the Week….hehe. So, imagine my surprise when Olivia came home last week with a gift because she was Student of the Week!! The gift is a book titled…..
LOL….how fitting. 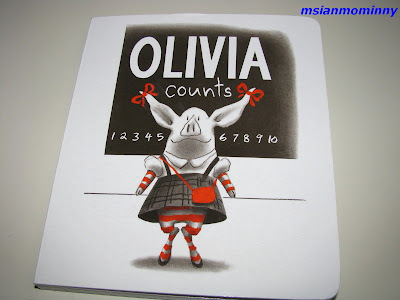 The book is about a girl pig named Olivia who is VERY mischievous. Sounds like some one I know….. I have been trying to get Olivia to give up her paci for a while. I would talk to her about giving up her paci but she would usually say No. Over the last few months, I would tell her periodically that we have to give the paci to the Paci Fairy, who will take it to the babies who need it. Then the Paci Fairy would leave her a new toy. I didn’t push for it as I believe when she’s ready, she will let it go. So, one night last week, she was cuddling with me before bedtime and I told her the Paci Fairy will come tonight to take the paci and leave her a new toy. She nodded her head and said ok. In the middle of the night, her paci fell out of her mouth and I took it away. She woke up crying for the paci but I did not give in. I told her she has a new toy. At first she refused the new toy but eventually she wanted it. The rest is history. She never asked for the paci since that day and never even cried for it. I was pleasantly surprised. I thought I would have some sleepless nights but everything has been easy so far. It is taking her a while to fall asleep but she will get use to it very soon. So, write this date down: December 1, 2009….the date Olivia was weaned off the pacifier. Hooray! I don’t know what made me choose that day but like I say, always trust your mommy’s instincts. Working mom of an adorable little girl. Originally from Penang, Malaysia, currently residing on Long Island, New York.